“So much effort was made to stop the nuclear arms race, the Cold War…we have learned nothing from it. And now there are even talks about war again,” he said. European countries had a total freedom of choice in terms of what policies to follow, but Americans did their best to “lay their hands on it,” Gorbachev believes. 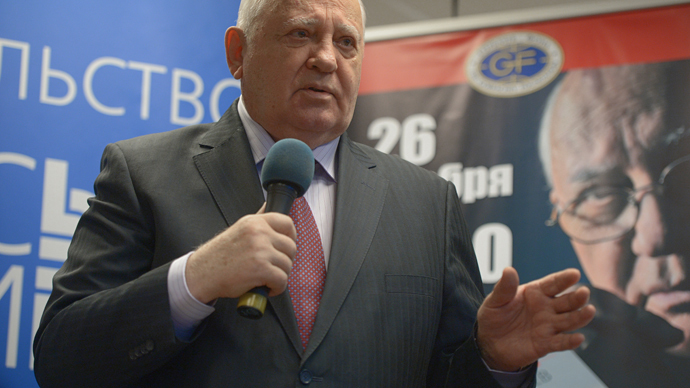 Earlier, Gorbachev warned Western and Russian leaders against dragging the world into a new Cold War amid the Ukraine crisis. Back in December he said that “there are signs of Cold War” in the recent cooling down of relations between Moscow and Washington. And while Europe must become the locomotive of shaping the new world order to prevent new conflicts, he said it is being pushed in the opposite direction. US policies, Gorbachev says, are defined by the defense industry which has a heavy influence on the country’s economy, politics, culture and art. “American foreign policies to a great extent are controlled by anything but democratic forces,” he said. He reiterated his belief that the US needs political and economic reforms similar to ‘Perestroika’ carried out in the Soviet Union during his rule in the 1980s. On the eve of the 70th anniversary of victory over Nazi Germany in World War II, Gorbachev expressed wishes for Russian people to always be proud of their ancestors and the history of their nation. “A Russian person has reasons for patriotism,” Gorbachev said, adding that anyone who sincerely loves the motherland also loves and engages in everything unfolding there. “No matter what happens to me, I am not going to flee [Russia], I could have fled, but no, I think it's the last thing to do,” Gorbachev said. Russia will mark the 70th anniversary of wartime victory on May 9 with military parades in honor of the holiday being held in cities across the country. More than 78,500 people will take part in the parades and almost 2,000 items of military equipment will be put on display.